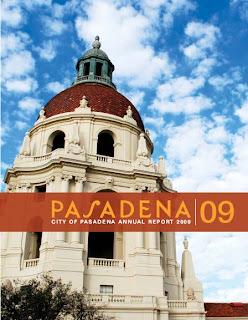 2009 Annual Report is Online! Our first-ever annual report, which made its debut at Mayor Bill Bogaard's State of the City event, was the brainchild of City Manager Michael Beck. In the interest of environmental stewardship only a limited number were printed, but you won't be left out in the cold because it's posted on the city website! It was researched and written by yours truly with lots of input from departments (thanks, everyone! ), and designed by the mighty Zack Stromberg, who also shot most of the large-format photos. My favorite: a ceiling shot in the council chamber. Kudos also to Assistant PIO Linda Centell, proofreader and editor extraordinaire. For the second time in Mystery History, um, history, I'm not prepared yet with the full scoop! I had some newspaper articles that we were absolutely, positively sure were all about the background to the photos on the contact sheet above, but on closer inspection yesterday the articles are from 1926. 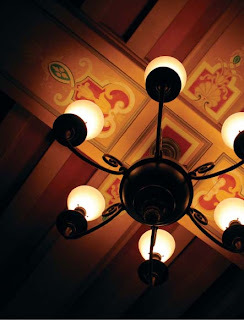 Trouble is, the photos above were clearly shot at Pasadena City Hall (the fountain and the urns are the dead giveaways). This building didn't open until the following year. 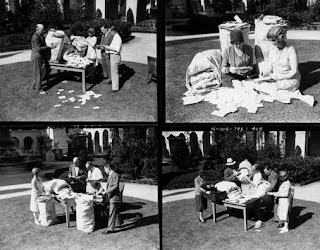 Give me a little more time to continue this wild goose chase -- with the help of Martha Camacho, one of our crackerjack researchers at Pasadena Public Library. 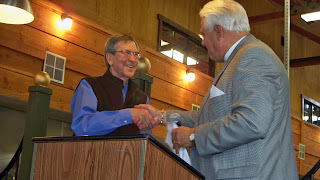 And remember -- Mayor Bill Bogaard's 2010 State of the City event is tonight! It's free and open to the public. It Was a Grand Re-opening! Robinson Park re-opened on Saturday with plenty of sunshine beaming down on the spectacular new field as the rain clouds started moving in again. But nothing could rain on this parade! It was a perfect example of the city/community partnership that made the renovation possible. A formal program got things started, with dignitaries including Chris Holden (above), City Manager Michael Beck (below) and other city and community leaders. The official ribbon was cut by Councilman Holden and Mack Robinson's widow, Delano Robinson, surrounded by community leaders and city officials. 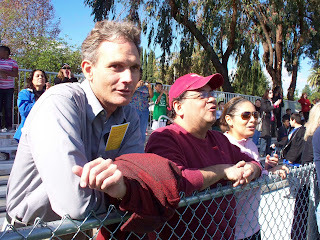 Then it was on to an exhbition softball game with city staff (team name: The Pasadena Bureaucrats) vs. a community team. Due to wet dirt (some might call that mud! 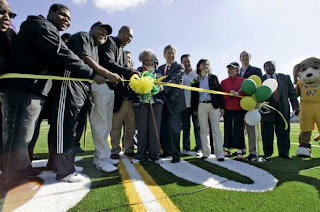 ), the new football field doubled as a baseball diamond. The city's team warmed up with stretching exercises. Here's Bill Huang up at bat, with California Assemblyman Anthony Portantino serving as umpire. Bill is the director of our Housing Department. Brian Biery of the Flintridge Operating Foundation (left), Steve Lizardo and Vannia De La Cuba, field representative to Vice Mayor Victor Gordo, gave magnificent color commentary! In the catcher's position: Martin Pastucha, director of the Public Works Department. The team shirts are part of our City of Pasadena souvenir collection. That's Patsy Lane, director of the Human Services and Recreation Department, on the left and Debbie Humphrey, executive secretary for the Libraries/Information Services Department. Meanwhile, on the other side of the park, Pasadena police commanders were cooking hot dogs and there was a line-up of information about City of Pasadena programs and services. That's Alejandrina Flores, manager of our Neighborhood Connections Office, in the blue jacket at the first table. 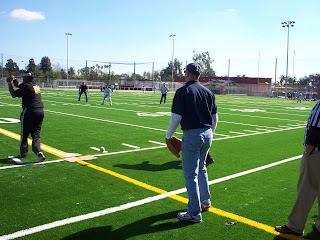 I took all of the photos in this posting with the exception of two: the ribbon cutting and the first pitch, both courtesy of the Pasadena Star-News. Barbara Ellis was almost there with her 2:52 p.m. Tuesday guess "Waiting for President Taft to arrive at the Pasadena railway station after his visit to the city in 1909?" So I'm giving her the fabulous prize this week! 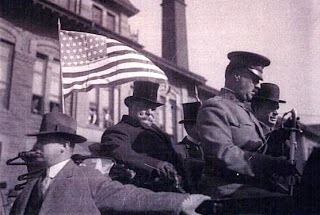 Yes indeed, President William Howard Taft visited Pasadena on Oct. 12, 1909, during an automobile tour of California. 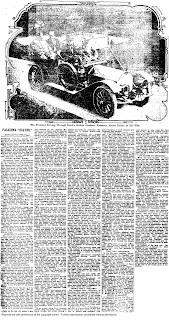 He was the first U.S. president to use automobiles for official state occasions. His automobile of choice: the Pierce-Arrow. In the photo above, household help at the Fenyes estate wait for President Taft's motorcade to pass on Orange Grove Boulevard. 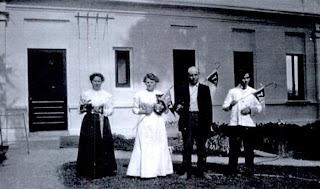 The photo detail only includes their first names -- left to right are Mina, Catherine, William and Joe. 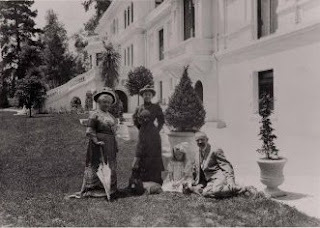 This must have been a welcome respite from their daily work in the mansion on Millionaires Row. Here's a photo of President Taft in his chauffeured automobile, complete with secret service agents. The Oct. 13, 1909, Los Angeles Times article titled Pasadena "Heaven" to the President is too grand not to share with you, so I've included it at bottom of this post. You'll want to double-click! Eva Scott Muse was a divorced mother with one child when she met Dr. Adalbert Fenyes, a Hungarian nobleman and physician, during her travels in Egypt. 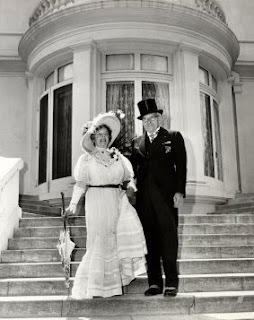 They were married in 1895 and the following year moved to Pasadena where she commissioned an architect to design the now-famous Fenyes Mansion. She was a very progressive thinker and had a salon built at the mansion where she hosted groups of artists, writers, actors and musicians. Here's a 1911 photo of (left to right) Eva Fenyes, her daughter Leonora Muse Curtin, granddaughter Leonora Curtin and husband Adalbert. 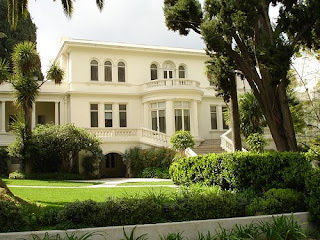 In 1970 the two Leonoras donated the estate to the Pasadena Historical Society, now called the Pasadena Museum of History. Mrs. Fenyes's granddaughter, Leonora Curtin (the little girl two photos up), married Finnish diplomat Y.A. Paloheimo, who became Finnish Consul for the southwest region of the U.S. Today, in addition to the wonderful history, grounds, furnishings and collections at the Fenyes Mansion, there is a wonderful gallery of Finnish folk art and other items. Here's a photo of the Paloheimos in period costume during an event in the 1970s at the mansion. I was so fortunate to have been invited to Finland in summer 2008 with Mayor Bill Bogaard and his field representative Judy Kent for the occasion of the 25th anniversary of Pasadena's Sister City relationship with Järvenpää. Our last evening there, we were hosted at a beautiful manor house owned by the Paloheimo Foundation. OK, here's the L.A. Times write-up about President Taft's visit! Wednesday, Jan. 20 at 1 p.m. -- This week’s film in the Donald R. Wright Auditorium at Pasadena Central Library, 285 E. Walnut St., is “L.A. 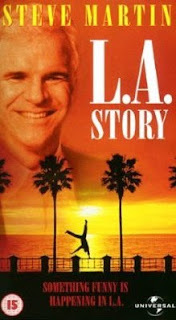 Story” (1991, PG) starring Steve Martin as a wacky weatherman who tries to make sense out of the hustle and bustle that is Los Angeles. (626) 744-4066. 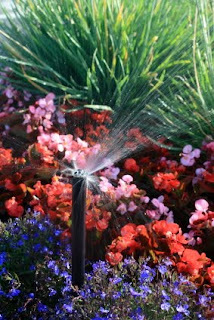 Thursday, Jan. 21, from 5:30 to 8:30 p.m. – Is your landscaping or lawn-care professional aware of the best techniques for evaluating the efficiency of your sprinklers, troubleshooting for water waste and designing the most efficient irrigation system for your property? If you’re not sure, pass on this information about a free workshop series over the course of four Thursday evenings. Space is limited and registration is required. Saturday, Jan. 23, from 9 a.m. to 1:30 p.m. – Join the celebration as Robinson Park, 1081 N. Fair Oaks Ave., re-opens with tours, food, exhibition softball game (city staff vs. community leaders), live music, children’s activities and more! Saturday, Jan. 28, at 6:30 p.m. -- Mayor Bill Bogaard’s 2010 State of the City event. Please note that the Jan. 18 Pasadena City Council meeting has been canceled, and city administrative offices, libraries and community centers will be closed that day in observance of Martin Luther King Day. 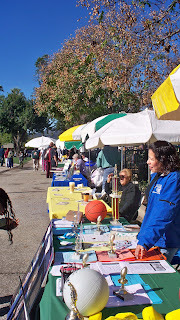 A full calendar of community events can be found here. Looking for a commission meeting? You'll find agendas here. It has been several weeks since I've stumped you, and now I've done it again. Some of you came close but didn't quite get there. You can't win 'em all! 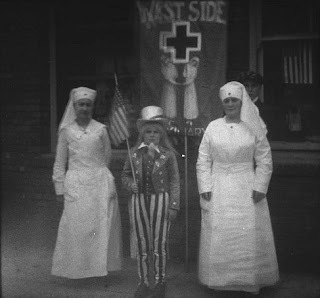 In the photo above, two Red Cross nurses and a child in an Uncle Sam costume prepare to march in the Patriotism Day Parade on March 28, 1917, in support of the United States entering World War I. ...Patriotic organizations, civil war veterans, business men's groups and others will participate in the great parade which will precede the patriotic mass meeting in Library park Wednesday night. The parade will mobilize on Madison avenue, on both sides of Colorado street, and will start promptly at 7 o'clock to march to Library Park, where the mass meeting is scheduled to open at 7:30 o'clock. ...One feature of "patriotism day" is displaying of the Stars and Stripes everywhere. It was noted by the committee today that this custom is already prevalent, Old glory being seen on every hand. 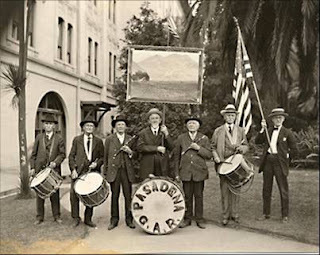 Here's a 1922 photo of the Pasadena chapter of the Grand Army of the Republic mentioned in the article above -- veterans of the U.S. Civil War who fought for the North. That the present crisis in international affairs constitutes a "special occasion" warranting the display of the United States flag in Pasadena to the fullest extent possible, was the statement today of Chairman A.L. Hamilton of the City Commission. Recently the city distributed 150 large American flags, a gift from Mrs. E.W. Brooks. The number had been increased from 100, the amount originally provided, because of the great demand. Everyone receiving one of these flags agreed to display it on all holidays and special occasions. Chairman Hamilton remarked today upon the fact that few of the flags seemed to be in evidence, and he said the present situation was one calling for the showing of the flag as a mark of patriotic spirit. "The American flag," said Chairman Hamilton, "stands for right and freedom and justice. Those are the principles that should be called to mind when one sees the American flag flying. Here's a photo of Chairman Hamilton from the Hall of Mayors. ...City officials continue to take the lead in steps to prepare themselves or offer themselves for United States service. City Attorney James Howard is among those signed up for the officers' reserve corps and City Prosecutor L.L. Riccardi has followed in his footsteps. Both are studying for the examinations and will be members of the instruction class when it is started. Today J.E. Carpenter, superintendent of the municipal water plant, consulted with City Engineer R.V. Orbison relative to finding a place in the service in the event of war where his experience would be of value. Even if the city had not declared it would keep open the position of any employe that enlisted, Mr. Carpenter asserted he felt it his duty to offer his services. Congress approved President Woodrow Wilson's request for a war resolution on April 6, 1917. 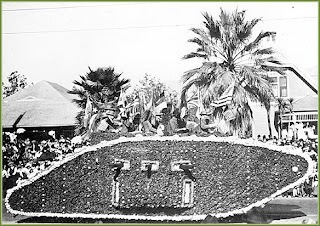 The Los Angeles Chamber of Commerce had a float in the 1918 Rose Parade -- a flower-laden tank with doughboys on it. Pasadena's World War I Memorial is at the northeast corner of Colorado and Orange Grove boulevards. Many thanks to Pasadena Public Library, Tournament of Roses Association, George Eastman House Photography Collection and Michael Beck. Nothing brings church and state together better than good food! Bishop Jon Bruno, leader of the Episcopal Diocese of Los Angeles, presented Pasadena Mayor Bill Bogaard with the key to Mama's Small Business Kitchen Incubator during an open house today. Dozens of people were on hand, from elected officials and funders to community leaders and local residents. 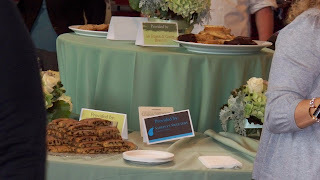 Perhaps best of all, each of the 30 small business enterprises were there with samples of their food, including Auntie Fruf's Aahsome Fudge, Texas Fajita Company and Green Apple Gourmet. 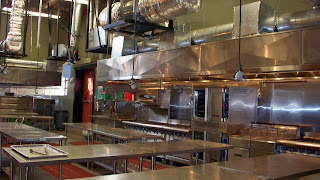 Here's one of several very large kitchens -- empty when I shot this because all the entrepreneurs were serving their wonderful food in another part of the building. Created by the diocese and funded in part by a Community Development Block Grant from the City of Pasadena, Mama's is a commercial food preparation and education area designed to help small-business entrepreneurs start new food-based businesses; and accelerate the growth and success of existing enterprises. See this morning's Pasadena Star-News article here. And there's an interesting photo gallery of a couple of the entrepreneurs in action here. It can be intimidating -- and risky -- for a foodie to start a first-time business; the capital costs of the kitchen equipment alone can be astronomical. So Mama's provides this large facility where these entrepreneurs can achieve their dreams by using shared kitchens and taking the time to develop their skills and business plans. Dreams do come true in Pasadena! Mama's Small Business Kitchen Incubator is at 45 N. San Gabriel Blvd., one block north of Colorado on the west side of the street. Stop by for a tour any Monday through Friday from 10 a.m. to 3 p.m. (626) 744-9995. Karin wins with her Tuesday 9:42 a.m. guess "Jackie Robinson's mother reading about his induction into the baseball hall of fame, 1962." 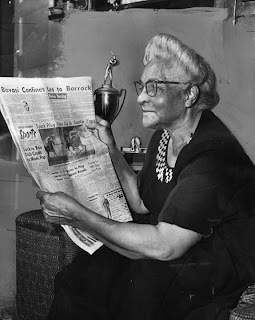 In the photo above, printed in the Los Angeles Herald-Examiner in 1962, Mallie Robinson sits in her Pasadena home at 133 Pepper St. and reads the news that her son will be inducted into the Baseball Hall of Fame. Mrs. Mallie Robinson, Jackie's 72-year-old mother, reads story of son's Hall of Fame election in Pasadena home. "I knew he'd make it," she said. Born Jan. 31, 1919, in Georgia and raised in Pasadena, Jack Roosevelt "Jackie" Robinson was a graduate of Washington Junior High School, Muir Tech and Pasadena Junior College. He left UCLA just a few credits short of graduating and joined the U.S. Army. 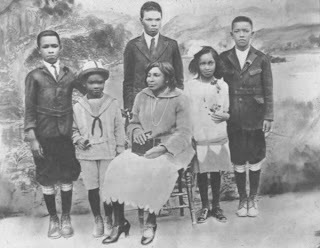 After her sharecropper husband abandoned the family, Mallie Robinson packed up her five children (Jackie was 16 months old) in 1920 and boarded a train from Georgia to Los Angeles. She rented an apartment in Pasadena and later they moved in with a family on Glorieta Street. After she found steady work as a domestic worker, Mallie bought the house on Pepper Street in 1923. 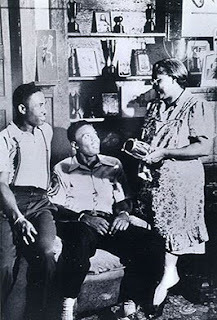 The Robinsons were the first African American family on that street. The home was demolished in the early 1970s; a plaque in the sidewalk marks the site. Mallie is seated below with her children -- left to right -- Mack, Jackie, Edgar, Willa Mae and Frank. 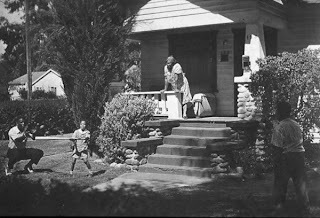 And here's Jackie (left) as a teenager, playing ball in front of the house on Pepper Street. Jackie (center) visited home in Pasadena with Mack and Mallie in 1947. Several days before the winners were announced, before leaving for my office at Chock Full O'Nuts, as I kissed Rachel good-bye, she told me to "be very careful what you say today." Rachel has almost always agreed with my basic intentions when I sounded off. I could tell she was concerned that I might unnecessarily say something which would hurt my chances of being chosen. On the evening of Tuesday, January 23, I learned that the baseball writers had given me 124 out of 160 ballots cast. Appropriately, I was with Rachel in Stamford when the word came. The phones began ringing. The newsmen and cameramen began arriving. Everybody wanted to hear my reaction. Truthfully, after having steeled myself to be passed over and not to let it hurt me a lot, I was almost inarticulate. 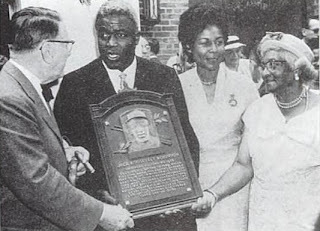 Branch Rickey (left) joins Jackie, Jackie's wife Rachel and his mother Mallie after the induction ceremony in Cooperstown, New York. Jackie passed away at the age of 53 -- too young -- on Oct. 24, 1972, at his home in Stamford, Connecticut. 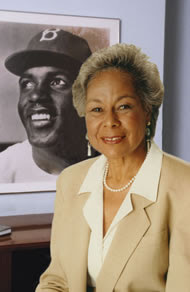 Rachel Robinson keeps her husband's legacy alive through her work with the Jackie Robinson Foundation in New York City, which she founded. 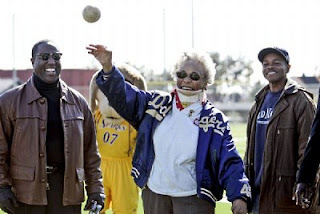 Pasadena has paid tribute to Jackie Robinson and his family in many ways: a community center, post office, stadium, ball field and more bear the Robinson name. 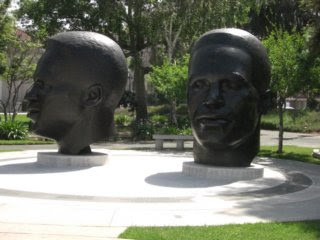 Please allow me to correct one mistake many people make: Robinson Park in Pasadena was named in honor of the entire family, including Jackie, Mack, the other siblings and Mallie. There is no such thing as Jackie Robinson Park in this city. The Robinson Memorial, created by artists Ralph Helmick, Stu Schecter and John Outterbridge across the street from City Hall, is a wonderful installation that honors Jackie and Mack. When you visit, be sure to go around to the back side to see the symbols and inscriptions on the backs of the heads. I'll have more about Mack and the other siblings another time. Many thanks to the Jackie Robinson Foundation, the Robinson family and the National Baseball Library for use of some of the photos. Our studio will still be in the back building at the southwest corner of Los Robles and Woodbury, and our small production room will still be across from the council chamber at City Hall. But on Jan. 12, after more than two decades, 55 KPAS will move to channel 3 on the Charter Communications system. This is a decision of Charter, not the City of Pasadena. Charter did offer to provide in-kind services to help promote the change, so I took them up on their offer. I wrote the PSA that they produced, which is running on many of the cable channels throughout their system. You can see it here. Depending on your browser, it's either at the top of the screen or you'll have to scroll down to the bottom to see it. Of course, you can always view KPAS online here (click on Video Streaming at the ride side of the screen).